The Strand Theatre was the venue for last night's Dorchester Christmas Celebration, featuring the Boston Classical Orchestra under the direction of conductor Steven Lipsitt. 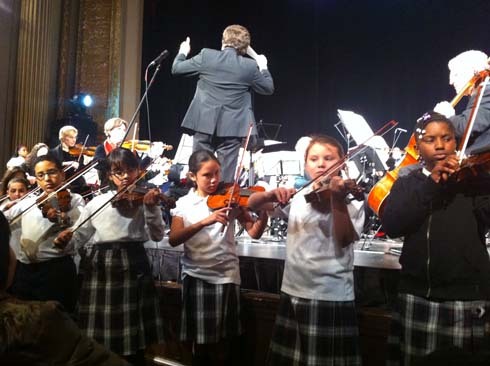 Above, Lipsitt led the orchestra in a rendition of Jingle Bells, accompanied by the string ensemble from the Pope John Paul II Catholic Academy. Members of the Boston City Singers helped to lead a memorable sing-along to conclude the evening's show, which was hosted by novelist and TV personality Kim McLarin. The performance lasted about one hour and 15 minutes and drew a crowd of about 500 people to the theatre. Tickets were priced at $5-10 to attract families from the neighborhood. The Boston Classical Orchestra intends to make the Strand Theatre its second home, according to executive director Sean Roberts, a resident of nearby Jones Hill. Support for the concert has come from the Mayor’s Office of Arts, Tourism & Special Events and Boston Main Streets, along with corporate sponsors such as Mt. Washington Bank.